Latest Finds | Page 173 | Interior Boutiques – Antiques for sale and mid century modern furniture, french furniture, antique lighting, retro furniture and danish furniture. Condition Report : Newly Upholstered . 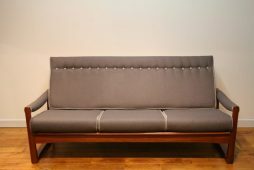 This Greaves & Thomas teak framed Put-u-Up sofa has been newly re-upholstered in a fire-retardant chenille fabric. In the 1960s Greaves and Thomas catalogues they were called Put-U-Up Lifa settees . They were designed for occasional guests rather than permanent ones . The sculptural teak arms have been given a light clean and oil,and are in lovely vintage condition . The sleeping surface is 186cms long and around 110-112 cms wide . The max length of the sofa including arms is 204 cms . Condition Report : Re-upholstered / Re-polished Frame. 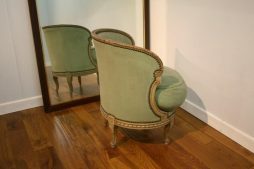 An extremely rare pair of high backed armchairs, made by quality British firm Dalescraft. We date these chairs to the mid-late 1950s. They have been fully restored from the ground up, with the original horsehair being replaced by its modern day equivalent (rubberised horsehair). The fabric has been replaced with a quality wool felt, with the objective of trying to keep close to the colour of fabric originally used. The frames have been reset, rectifying any loose joints, stripped and cleaned and newly polished. 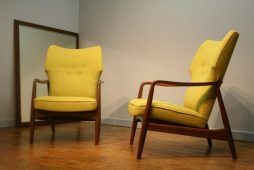 An extremely stylish vintage pair of chairs, which are now like new! Condition Report : Cleaned and re-polished. 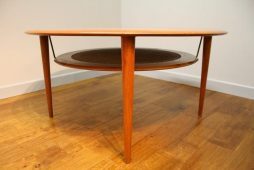 Peter Hvidt and Orla Molgaard Nielsen designed this lovely circular teak coffee table in the late 1950s for France + Daverkosen , who then became France +Son c 1960 . 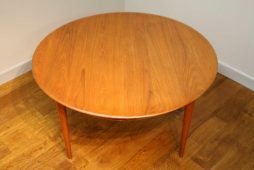 France + Son pieces are always lovely quality , and this solid teak piece is no exception . The teak has been cleaned as there were a few marks after over 50 years of use , and then it's been re-polished . 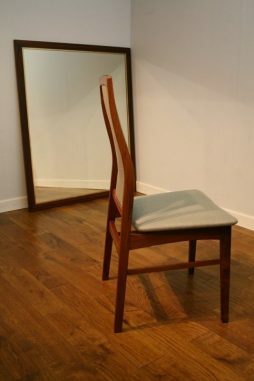 Its now in beautiful condition , with only minor marks to the cane magazine shelf which would only be seen if you go down on your hands and knees and closely inspect it ! It's got its original France + Son label . The legs unscrew as with many Danish designs of the period . Condition Report : Good vintage condition . 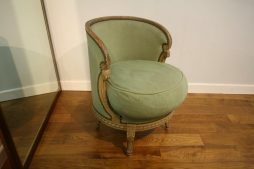 A lovely quality French Louis XVI style small armchair dating to the 1920s or 30s . The carved frame retains its original cream painted finish in good vintage condition . The seat has a loose deep feather cushion , and the chair was probably last re-upholstered circa 1960 . the upholstery is in useable condition and suits the chair . We're selling it in “as is ” condition , but we can get a quote for re-upholstery from our in-house upholsterer . The chair has a proper old-fashioned sprung base . 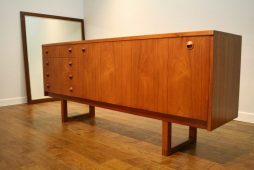 Top quality Danish teak tambour door sideboard c 1960 . Not labelled , but we found 1 other that was described as being designed by Johannes Andersen . However we've not found any definite proof of this , so we're describing it as possibly designed by him at this stage . 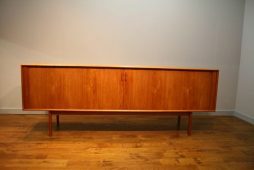 It dates to circa 1960 , and its great quality as you'd expect from a good Danish piece of this era , with lovely subtle detailing . 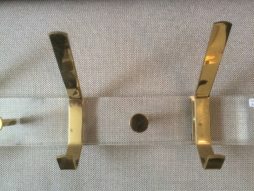 We've given it a light clean and polish , but as so often with pieces that have been used you will see tiny signs of wear if you scrutinise it very closely . Condition Report : Cleaned and re-upholstered . 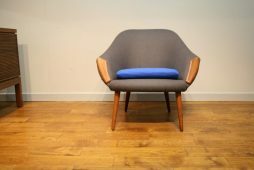 We have 2 pairs of these lovely 1960s dark teak armchairs by Toothill . 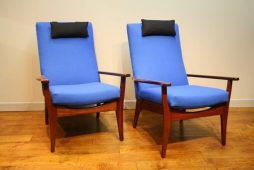 This pair we have re-upholstered in a blue Melton wool by Abraham Moon , the other pair await customers own choice of colour and fabric . 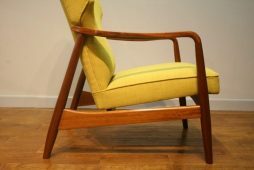 We have other chairs in stock by Guy Rogers , Toothill , and Greaves and Thomas as well as some Danish teak ones . All available for customers to decide their own upholstery requirements . We like to showcase possibilities and ideas , but we find that many people like to make their own fabric choices to suit their taste and interiors . Toothill were a small quality British maker in the early to mid-1960s . Condition Report : cleaned , oiled and re-upholstered. 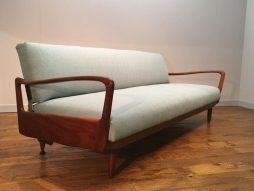 Guy Rogers teak 1960s Virginia sofa fully refurbished and re-upholstered . 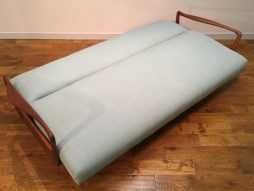 Guy Rogers of Liverpool were specialist makers of stylish sofas and chairs with teak frames in the 1960s , and this model was named The Virginia . We've had the teak cleaned and oiled , the back and seat totally re-webbed using Pirelli type rubber webbing , which with sensible use lasts 30-40 years , and was used originally on such pieces (we removed the original ) . The foam cushions are totally new and meet UK Fire Regulations . 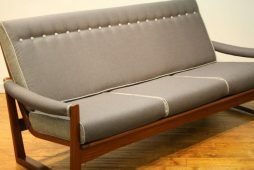 We've then used a Fire Retardant barrier fabric to Crib 5 , so its suitable for domestic and non-domestic use , before placing a dark grey Abraham Moon Melton wool fabric with lighter grey wool detailing using some left-over fabric to give it a special individual unique finish . We currently have other teak sofas by Guy Rogers and Toothill in stock which can be personalised to customers own choice of fabric/fabrics/detailing as well as singles and pairs of armchairs . 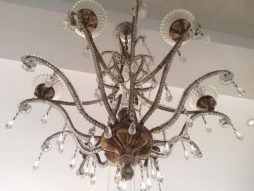 Some are on our website , but others are waiting to be refurbished before they can be photographed so ask for details . A cute 1960s Danish teak small armchair that we've had re-upholstered with new seat cushion an exact copy of the original in shape and size . 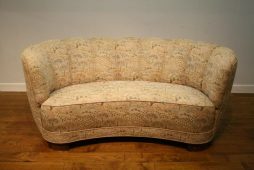 We have a number of others part-done or needing re-upholstery , so customers can often choose their own fabrics . 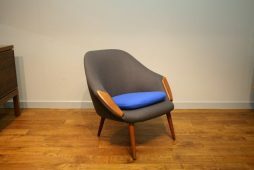 This one needed new fillings and the original fabric was well worn , so we re-upholstered it in 2 tones of Abraham Moon wool fabric , as it was originally done with a contrasting cushion . If you don't like the cushion colour this can easily be changed to a colour or fabric of your choice . 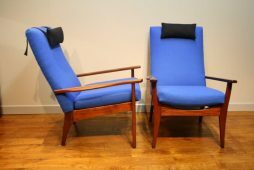 This is a design by an unknown small maker , and is a model we've never seen before even though we've had numerous Danish chairs of this era before . 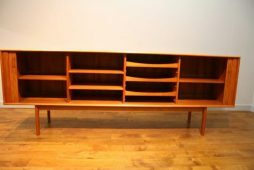 The style and quality of the teak used indicates an early 60s date rather than late 60s . Like many Danish chairs of this era , the legs unscrew . Condition Report : cleaned and oiled. 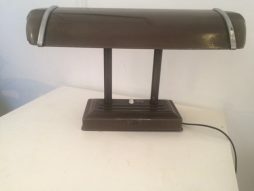 Dalescraft were a very small quality British maker in the early 1960s , their pieces were designed by Malcolm David Walker who deserves to be better known as he was a very accomplished designer for what was his family firm . 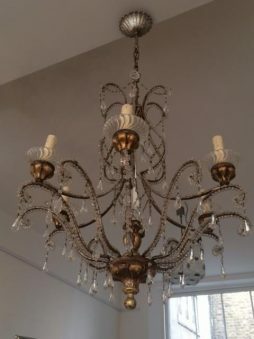 For a small company they had a very large range of designs , and this one will have been particularly expensive to produce due to the wonderful detailing and finish , and as a result is rarely seen for sale . The lovely exposed detailing is typical of top quality Danish designs by Peter Hvidt . 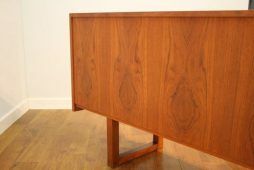 The teak veneered back is a feature that you'll only see on top quality pieces as it would normally only be seen when moving the piece . Condition Report : needs re-upholstery . 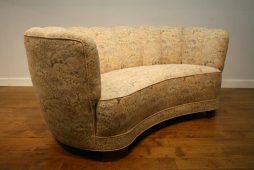 This Danish style of upholstered sofa dates to the late 1930s and into the 40s and sometimes very early 50s . It was made at a time when such pieces were designed to last for a lifetime and beyond . The build quality is amazing , and its extremely heavy with proper old fashioned springing . It was probably re-upholstered some 20-30 years ago , and is now looking a little tired and dated . An opportunity to stamp your own style by having it re-upholstered to suit your decoration . 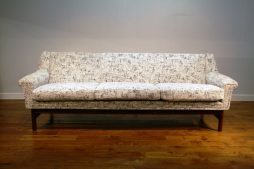 Our upholsterer can quote for upholstery , or you can use your own upholsterer . Broderna Andersson was founded in 1919 in Sweden by 3 brothers and is still a family owned business . At some point they must have also had a factory in Vejen in Denmark in the late 50s /early 60s as this top quality sofa is labelled with that address . They used various well known designers but as yet we haven’t found this model illustrated anywhere . It sits on a Bombay rosewood base the legs being solid , but the stretchers veneered which we have had re-polished as it was looking slightly dull . The original foam interior had started to deteriorate so we had it stripped and replaced before having it re-upholstered in a striking Romo fabric from their Kirkby Fade Range in Liquorice which not only suits its sleek lines but gives a distinctive modern twist that is not only practical but easy to co-ordinate with other colours . We can send you a sample of this lovely fabric . 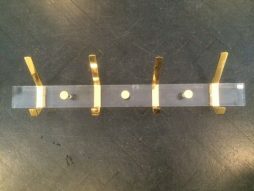 Further photos including 1 showing the makers mark are available . The rosewood frame can easily be removed which is useful if you it needs to be delivered up a staircase . 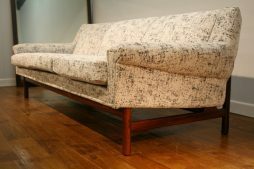 In comparison with a more standard Danish 60s sofa we recently sold this model is much heavier . 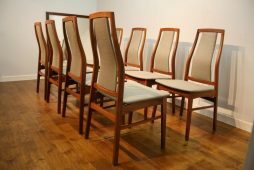 This set of 8 Danish dining chairs in Bombay rosewood are extremely comfortable and well made . The original fabric was a little worn so we replaced it with a good quality pearl grey fabric that we had in stock . Its a good neutral colour , with a little texture to the weave . Elegant pair of gilt wood chandeliers with fountain tops, 6 arms covered with strings of beads with crystal obelisk in center and prism drops. 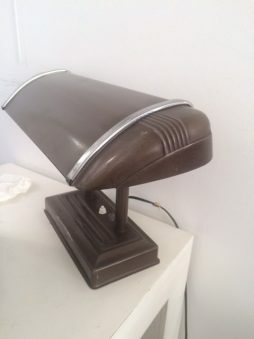 A metal industrial desk lamp.